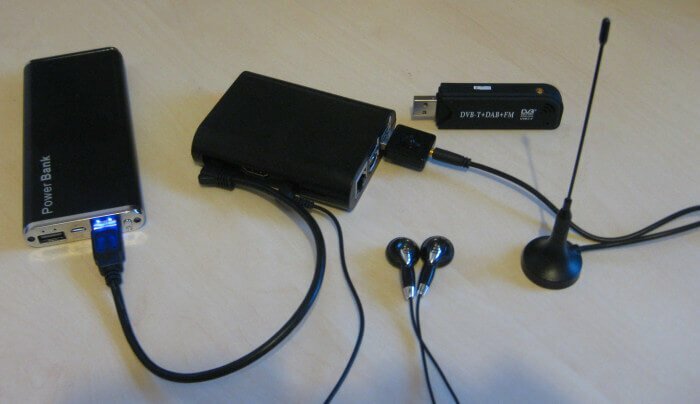 Over on YouTube user ModernHam has uploaded a video showing how to perform a replay attack on a car key fob using a Raspberry Pi running RPiTX and an RTL-SDR. 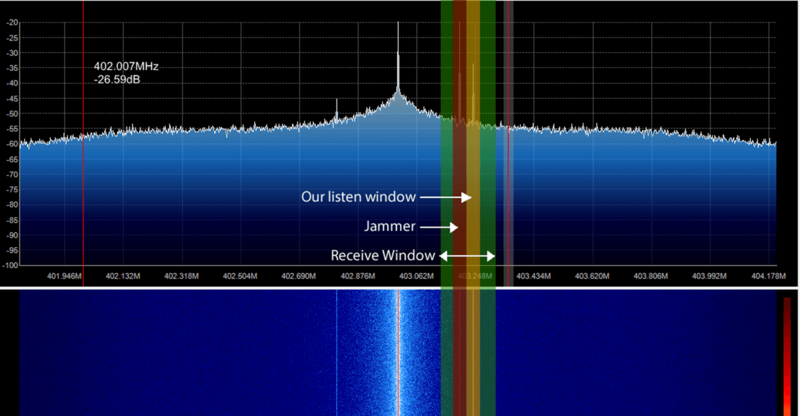 A replay attack consists of recording an RF signal, and then simply replaying it again with a transmit capable radio. RPiTX is a program that can turn a Raspberry Pi into a general purpose RF transmitter without the need for any additional hardware. The process is to record a raw IQ file with the RTL-SDR, and then use RPiTX V2's "sendiq" command to transmit the exact same signal again whenever you want. With this set up he's able to unlock his 2006 Toyota Camry at will with RPiTX. We note that this sort of simple replay attack will only work on older model cars that do not use rolling code security. Rolling code security works by ensuring that an unlock transmission can only be utilized once, rendering replays ineffective. However, modern rolling code security systems are still susceptible to 'rolljam' style attacks. In the video below ModernHam goes through the process from the beginning, showing how to install the RTL-SDR drivers and RPiTX. Near the end of the video he shows the replay attack in action. In this talk Samy Kamkar shares the exciting details on researching closed systems & creating attack tools to (demonstrate) wirelessly unlocking and starting cars with low-cost tools, home made PCBs, RFID/RF/SDR & more. He describes how to investigate an unknown system, especially when dealing with chips with no public datasheets and undisclosed protocols. Learn how vehicles communicate with keyfobs (LF & UHF), and ultimately how a device would work that can automatically detect the makes/models of keyfobs nearby. Once the keyfobs have been detected, an attacker could choose a vehicle and the device can wirelessly unlock & start the ignition. Like Tinder, but for cars. 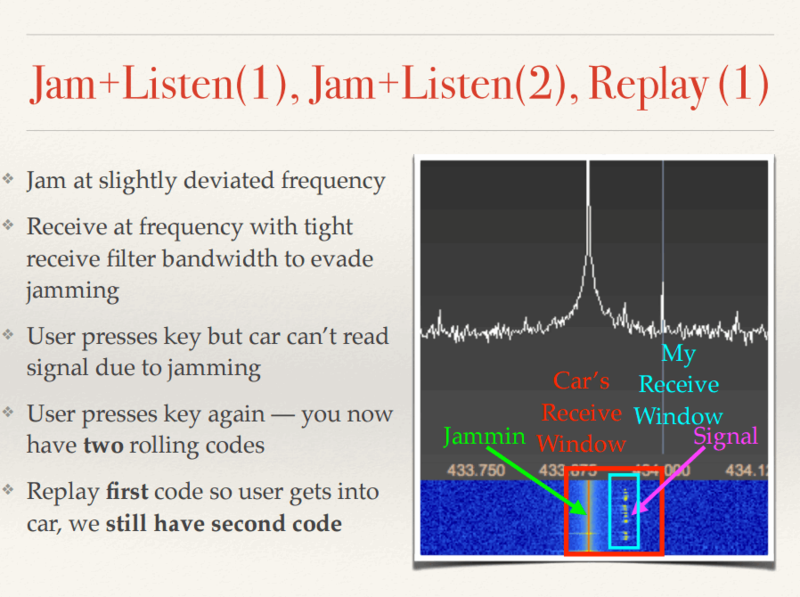 At this years Def Con conference speaker Samy Kamkar revealed how he built a $32 device called “RollJam” which is able to break into cars and garages wirelessly, by defeating the rolling code protection offered by wireless entry keys. Def Con is a very popular yearly conference that focuses on computer security topics. A rolling code improves wireless security by using a synchronized pseduo random number generator (PRNG) on the car and key. When the key is pressed the current code is transmitted, and if the code matches what the car is expecting the door opens. The seed for the PRNG in the car and key is then incremented. This prevents replay attacks. The RollJam hardware currently consists of a Teensy 3.1 microcontroller and two CC1101 433 MHz RF transceiver modules. It works by recording the wireless key signal, but at the same time jamming it so that the car does not receive the signal. When the key is pressed a second time the signal is first jammed and recorded again, but then the first code is replayed by the RollJam device. Now you have an unused code stored in RollJam that can be used to open the car. Samy shows how this works using an SDR and waterfall display graph in the following slide. Samy’s full set of presentation slides can be downloaded from samy.pl/defcon2015. Also several large publications including networkworld.co, Wired.com and forbes.com have also covered this story with longer more in depth articles that may be of interest to readers.